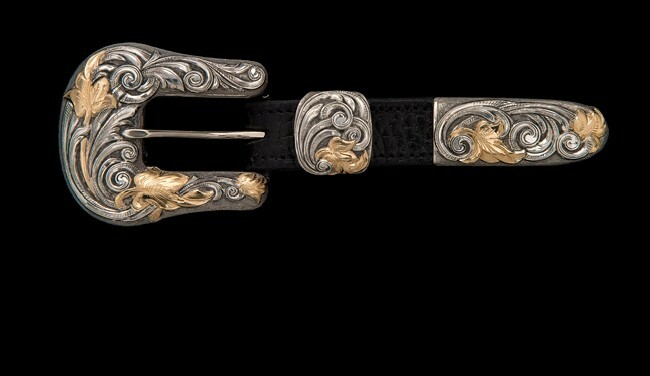 ￼This sterling silver 3-piece set, which fits a 1-inch belt, typifies the class and intricacies of the West. Overlaid red, green and yellow 14K gold intertwining scrolls emanate from a bed of individually overlaid sterling silver flowers which also feature 14K red, green and yellow centers. Each piece is hand-fit, filigreed and engraved. This is a sterling silver 2 1/4-inch by 1 7/8-inch buckle. 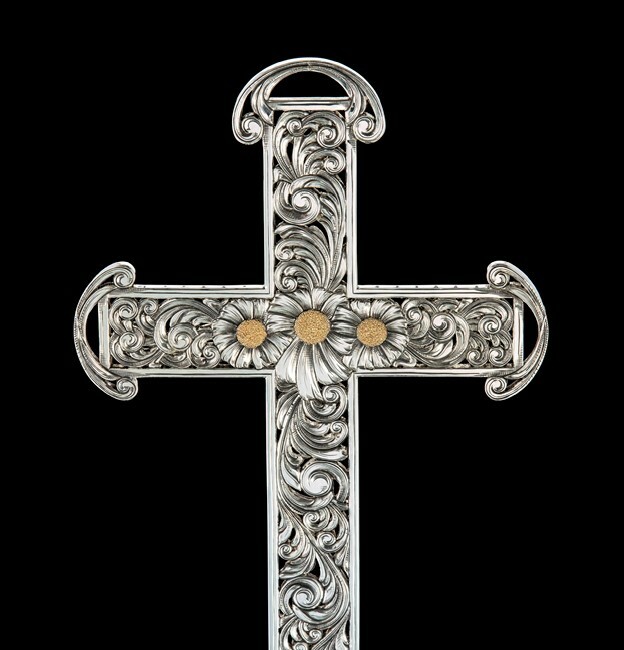 It is dominated by filigreed sterling silver scrolls and a flower with a 14K green gold center. 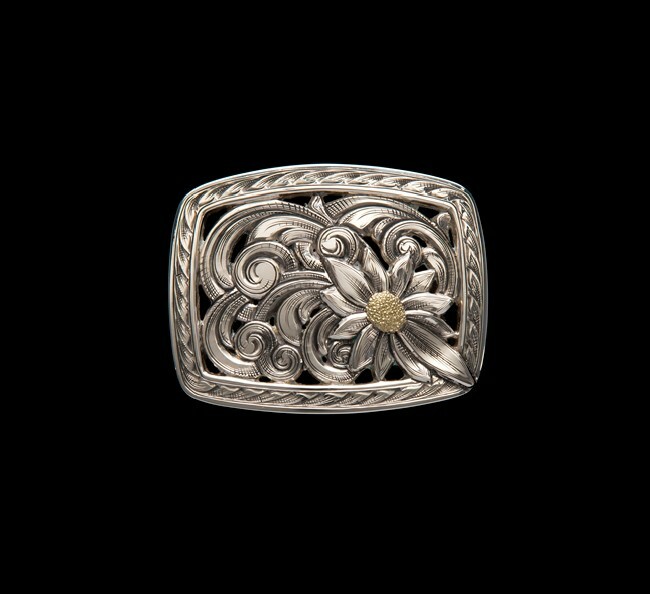 The flower literally spills over its border onto the unique buckle edge. 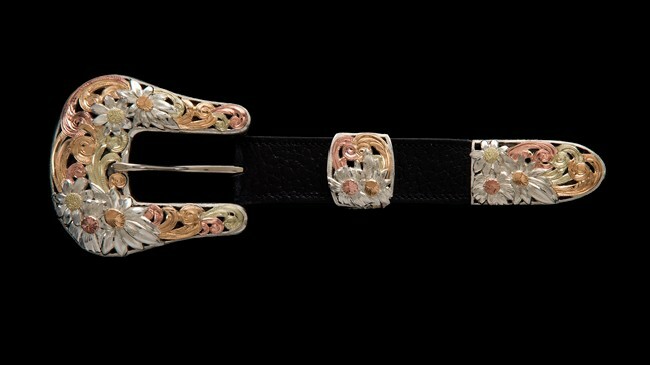 ￼This sterling silver 3-piece buckle set with 3/4-inch belt opening celebrates the playful side of nature with its overlaid sterling silver scrolls passing over, around and through 18K yellow gold leaves. Created in two parts, the base is hand-rolled heavy- gauge sterling silver and thick sterling wire creating a solid foundation. Hardy then brought together two sterling silver lariats, top and bottom, along with floral filigree around the center. This combines the cross and the 5-inch base into one piece.